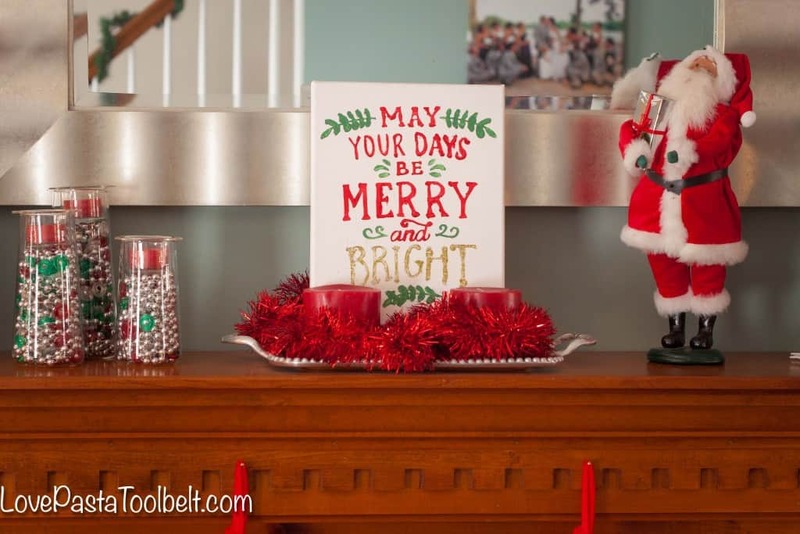 Add some cheer to your home with this DIY Merry and Bright Canvas! Christmas is my favorite holiday season, how about you? Something about the twinkling lights and the Christmas music just warms me up inside when it’s freezing outside. We’ve been hit with a burst of chilly weather lately and I’m sure it’s just going downhill from here. Winter weather isn’t my favorite, so I think I love Christmas because it adds a bright spot to part of the winter. I set out to make my first Christmas craft the other day. It was my first time really using my Silhouette Portrait for a project like this which I know is sad since I’ve had it since like July. But I’ve got to say, now that I’ve started, I’m kind of addicted. I’m so glad I bought it and if you don’t have one then you should consider sticking it on your Christmas list this year! Anyway, back to the project. When I started thinking about what to make, my first thought was “all is merry and bright”. So I had the quote a little wrong when I set out to find a design but I loved what I found. 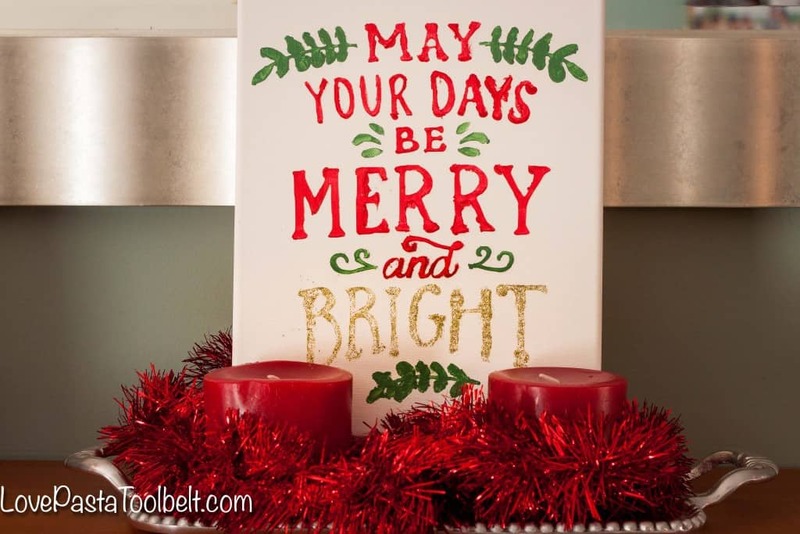 I purchased a design in the silhouette store that says ‘May Your Days Be Merry and Bright’ and used some silhouette stencil material to cut out the design. Once the design was cut I carefully removed it from the backing. One thing you have to remember to do and is one of the hardest parts is to get all the little middles of the letters, like the R’s and you have to place them on your canvas once you have your design in place. Stick your design to the canvas and then cover it with a thin layer of Mod Podge so that your paint doesn’t bleed. Let the Mod Podge dry completely and then begin painting your stencil in with your chosen colors. Once you are done painting carefully remove the stencil while the paint is still slightly wet. And viola you have a beautiful Christmas canvas! Now hopefully you’re a bit of a neater painter than I am. I tend to get rushed because I just want my project done so I ended up with a few imperfect spots but really I think those make the best projects because who wants perfection everyday right? I love how this project turned out and I am so excited to get it hung up with the rest of my Christmas decor. My tree is already up, how about yours? 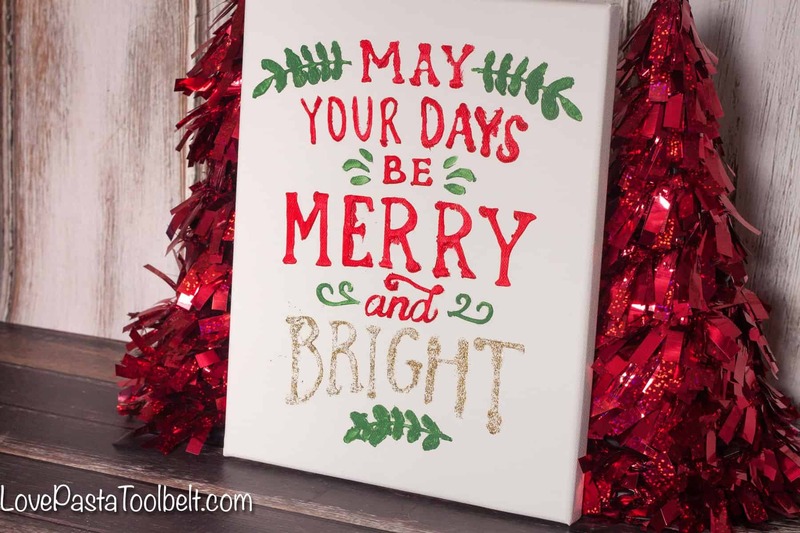 I’m pretty excited to be participating in the Creative Christmas Blog Hop with some other great bloggers so now you need to hop on over and check out all of their great projects for more Christmas inspiration! Super cute! I have a silhouette too and love it although I need to spend some time learning it so I can do more things! So fun participating in this blog hop with everyone! 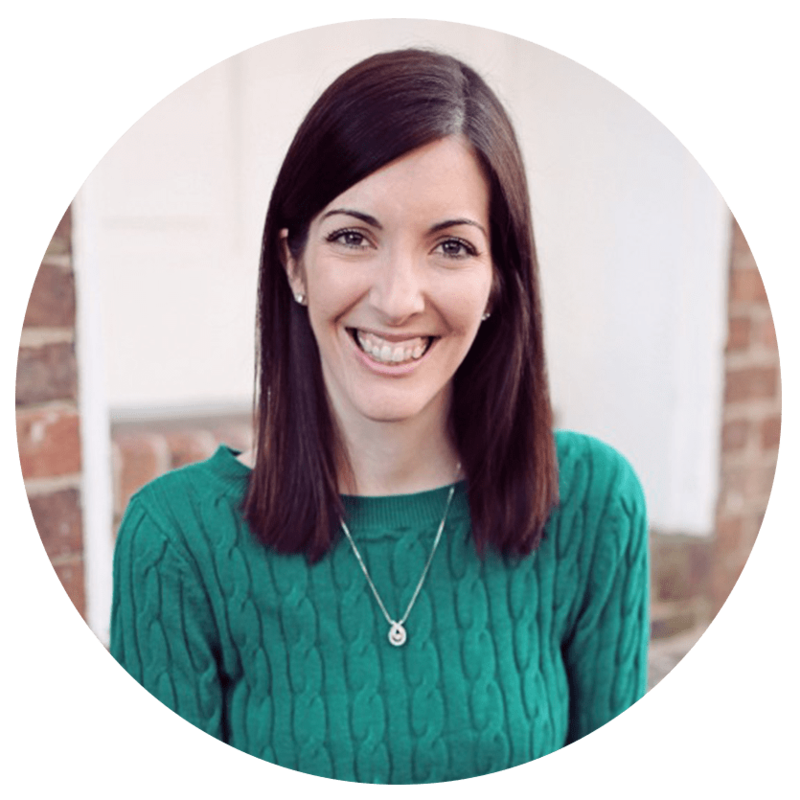 There are so many great ideas and I’m excited to look around on your blog some more! I am right there with you in needing to spend more time learning it! It’s so fun tho when you figure something out! So glad to have done the blog hop with everyone too, so much fun! Thank you! I am in love with how it turned out too haha! This is so cute! I love the ‘imperfections’ in it – it makes it truly your creation! I have a stack of blank canvas at home and this is inspiring me to do some Christmas painting. Thanks for sharing! I love how it turned out. I especially love that you used the classic Christmas colors. It really makes it pop! Thank you so much! 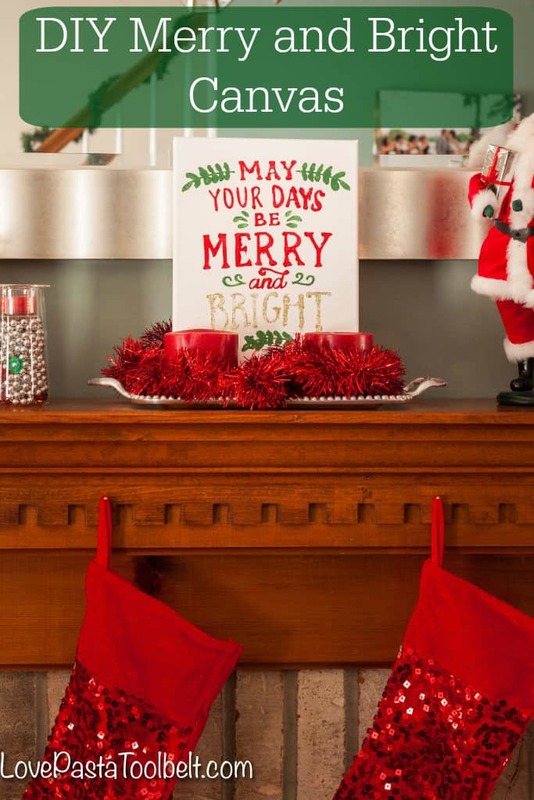 I love using the classic Christmas colors, they are my favorite! Cute sign!! I really like the phrase you chose to use. Fun sharing in the blog hop with you!